Pumpkin Cheesecake Bars are luxuriously creamy and rich, with lots of pumpkin flavor. Topped with a hefty amount of homemade cinnamon whipped cream. After I made the Instant Pot Pumpkin Cheesecake, I got so many requests to make an oven-baked version, that I got to work asap and make this layered Pumpkin Cheesecake recipe. 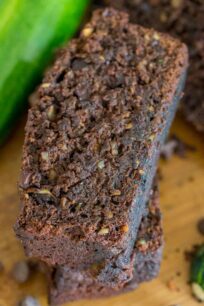 For more pumpkin flavor, check my Pumpkin Fudge and the most amazing Pumpkin Bread stuffed with cream cheese. If you want to go all in, make this Pecan Pie Pumpkin Cheesecake, it’s guaranteed to impress. Pumpkin Cheesecake Bars are my latest favorite fall dessert. They are irresistible, made of two layers: one is a classic vanilla cheesecake, and second, is a very flavorful pumpkin cheesecake. This cheesecake basically combines the best of two worlds, and the vanilla cheesecake balances the pumpkin flavor in the most perfect way. The cheesecake bars are topped with homemade cinnamon whipped cream, that is lighter in texture and works well with the fall flavors in this dessert. 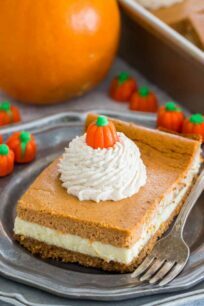 These Pumpkin Cheesecake Bars are a nice change from the classic Pumpkin Pie, if you are looking for something more special to try this fall season. You can also make this recipe in a large springform pan. You can skip the vanilla layer and mix the pumpkin puree into all the cheesecake batter, for a classic pumpkin cheesecake. What do you need to make Pumpkin Cheesecake Bars? Use almond meal instead of graham crackers. Making sure that all the ingredients are at room temperature and well combined after mixed. Adding flour or/and cornstarch to the batter. Avoid opening the door oven while baking the cheesecake. Watch the cheesecake closely to avoid over-baking it. When the sides are puffed and the center of the cheesecake is just slightly wobbly, the cheesecake is done. Cooling the cheesecake in the oven, with the door slightly cracked is also very important, as the sudden change in temperature can cause cracks. Bake the cheesecake in a water bath, its one of the most successful techniques to avoid cracks on your cheesecake. You will need: 1) small offset spatula or spoon 2) hot water 3) kitchen towel. Let the cheesecake completely cool and refrigerate for at least 6 hours or per recipe instructions. The cheesecake needs to be cold to be able to fix the cracks. Use the spatula dipped into hot water (or you can use your fingers or a spoon) to gently push and press down in the area of the crack and spread to fill it in until the top is smooth. Clean the spatula with the towel as needed. Once finished, clean the offset spatula with the kitchen towel again, and dip it again into warm water and smooth the top of the cheesecake. You can add a thin layer of sour cream topping if the cracks are small. You can add a layer of whipped cream topping. Wrap the outside of the springform pan in a double layer of foil, covering the bottom and sides of the pan, you need to cover the sides only from outside. This will prevent the cheesecake from water leaking in. If using a baking pan, there is no need to do this. Set the prepared pan in a large roasting pan that is deep enough to add water to it. Pour HOT water into the roasting pan, about halfway up the sides of the cheesecake pan. Transfer to a pre-heated oven and bake, until the center jiggles slightly like Jell-O and the sides are puffed and a light golden brown. The residual heat will cook the center of the cheesecake. If the cheesecake doesn’t wobble a bit in the center, it means it has been over-baked, and most likely will crack. Cool the cheesecake in the oven with the door slightly cracked for one hour. Run a long, sharp thin-bladed slicing knife under hot tap water or dip it into a glass of hot water prior to slicing the cheesecake. Wipe the knife clean and run it under hot water before making another cut. An easy, mess-free way to cut even slices is to use cheese wire or unflavored dental floss. This method can be easily used on cheesecakes baked in a springform pan. Clean the bits that stuck to the wire/floss before very cut. You can freeze the cheesecake BEFORE you top it with whipped cream. Make sure the cheesecake has fully cooled and also was refrigerated for at least 6 hours. Wrap cheesecake bars tightly with aluminum foil or plastic freezer wrap, or place in a heavy-duty freezer bag. Properly stored, it will maintain the best quality for about 2 to 3 months. Lightly coat a 9x13-inch pan with baking spray and set aside. Press the mixture into the prepared pan. Using a measuring cup, press the crust and try to line the sides about to the middle of the pan edges. Add the rest of the ingredients from the "Cheesecake Batter" list and continue beating until well combined and creamy. 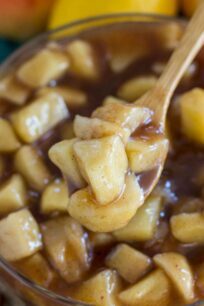 Scrape the sides and bottom of the bowl with a spatula. Remove crust from freezer and pour 1/2 of the cheesecake batter mixture into the prepared pan. Return to freezer for about 1 hour, the layer needs to freeze enough to be able to pour the pumpkin layer on top of it. Add the "Pumpkin Layer" ingredients to the remaining half of cheesecake batter that you set aside, and whisk to fully combine. Scrape the sides and bottom of the bowl with a spatula. Remove cheesecake from the freezer and pour the pumpkin layer on top. Level the top with a spatula. Read the post for "water bath" tips if you want to bake the cheesecake using a "water bath". Bake in the preheated oven for about one hour. Try not to open the door to the oven. At the 45 minute mark check on the cheesecake if its done. A small area in the center should wobble slightly and the edges should be puffed and light golden brown. After one hour, remove from oven and place on a cooling rack for about 2 hours, until the cheesecake is cool enough to be transferred to the refrigerator. Transfer to the refrigerator and chill for 6-24 hours. Add cream, sugar, vanilla and cinnamon to a large bowl. Add the whipped cream to a pastry bag, fitted with a star piping tip and pipe it onto cheesecake bars right before serving. I am so excited to try the crust with the added spices! That is such a smart idea! Cheesecake is always a winner! Wow, this cheesecake looks very tasty! This is absolutely fantastic! So YUMMY! Oh my, these look fantastic!! I can’t wait to make them for my family!! They would LOVE these!! These look AMAZING! What a great combo! I just made these- they were delicious, and super cute too! yes, they are so cute! happy that you liked these! cheese cake bars are really really awesome. You presented very well. Love your recipe. Keep up the good work. These look so good! Great Fall dessert for sure! I love that these have a graham cracker crust spiced with cinnamon, nutmeg and cloves. This is the perfect fall dessert for cheesecake and pumpkin lovers like me. Pumpkin recipes are my favorite this time of the year! I look forward to trying out different recipes with pumpkin. I will have to try this one. I would eat so many of these! I just love pumpkin things. And I love cheesecake, so this is the combo for me. That was absolutely fantastic! I love the little pumpkins you put on top of them too. It makes it look so cute I cannot wait to make them. Wow, these pumpkin bars just hit it out of the park! I love the little mallow creme pumpkin on top, what a cute touch. These bars look totally divine! Wow those looks really yummy! Pumpkin and cheesecake; hard to top that with anything! Pumpkin cheesecake?!!!! This sounds so good! I have never had a dessert like this but really want to give it a try. Thanks for the yummy recipe idea! I would love to have that in my belly! It looks so good, as does that incredible whipped cream. I’m coming over, save me a piece! It says a 9″ x 31″ pan, i don’t think that will fit in my oven, lol, just thought you would like to know. This looks like a tasty recipe for pumpkin fans! Those look delicious! 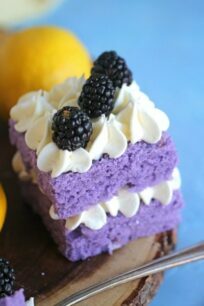 I should make some of this soon. I feel like we wait until Thanksgiving to make something like pumpkin pie, when we could be using pumpkin in lots of recipes. Oh my!! 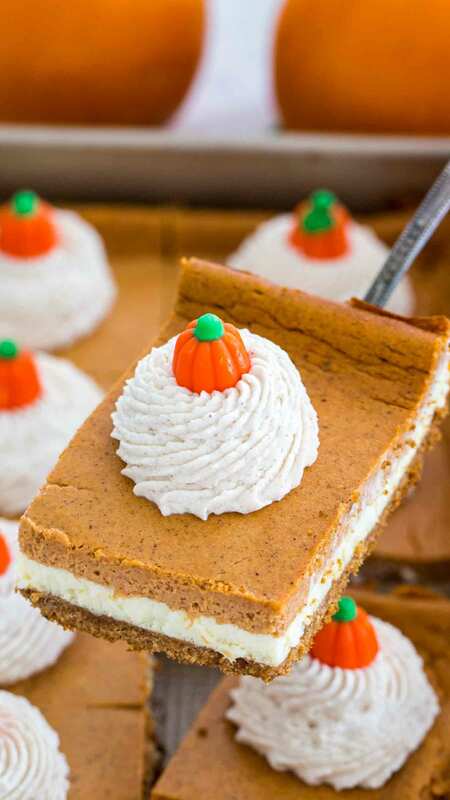 I am pumpkin obsessed and these pumpkin cheesecake bars look insanely good!! YUM!! It seems a great recipe that I should try. 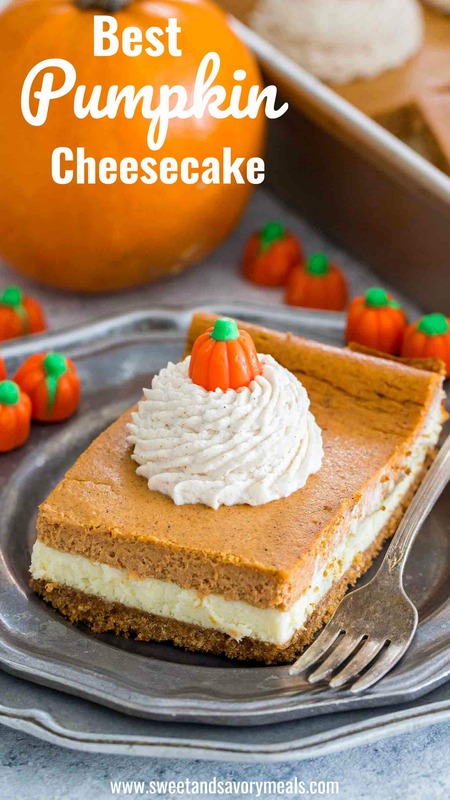 Cheesecake pumpkin bar sounds great and looks delish! Thanks for sharing. Okay, umm… yum, yum, and then yum?! I’ll be sitting here, waiting for my batch to arrive – these look absolutely delicious! Oh my these look so good and I would love to make this for my kids. Plus it’s Pumpkin season!! These are sooo cute and perfect for pumpkin season, what a great desser and use of the pupking. Its a hit for sure, thanks for sharing, really love then and the look is just pure quality! Your ultimate pumpkin cheesecake bars look out of this world. 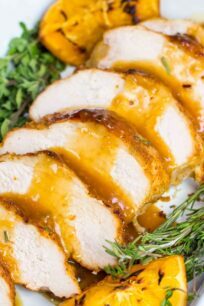 Perfect for a fall party or to serve for Thanksgiving. I am going to have to give your recipe a try! These look fantastic! I can’t wait to bring them for Thanksgiving! Am I missing something? Why are we reserving half of the cheesecake layer? to add the pumpkin to it, one layer is white and one is pumpkin. Wow these are festive and good looking, they are trully perfect match for fall season!!! Thanks or these! The nutritional information on the bottom…is that the whole thing or just one piece? I wish it was the whole thing 🙂 its per serving. Where dies the rest of the cheese mixture go? Please read the instructions carefully, it says to add the pumpkin to it. After making these cheesecake bars, I am really exited. The bars came out just like on video, taste great and look even better. They are just excellent!!! Can’t wait to make this! Looks delicious. Just curious, where did you find those lil pumpkins or did you make them yourself? I got them from Duane reade, but they are everywhere now! It says to put the crust in the refrigerator for 20 minutes. Then it says to remove the crust from the freezer. So where do I actually put it. Also, while the white cheesecake is in the freezer, should I put the pumpkin mixture in the fridge or is it ok to sit out for an hour? oops sorry, I actually put the crust in the freezer, but refrigerator is fine too. You can leave it at room temperature for one hour, it won’t go bad, or you can chill it. Will the cinnamon whipped cream keep in the pastry bag and not used until I’m ready to serve? I am taking these to work and wanted to add the cream when we are ready to eat them. Thanks! If you want it to keep, make sure you add whipped cream stabilizer. You can find it in the baking section or usually next to pudding mixes. Also, the bag needs to be kept on ice, whipped cream will melt if kept for too long at room temperature. yes you can, it will work fine. Hi Catalina, I’m planning to make this for Thanksgiving this weekend (Canada). I’d like to make it in a springform pan. What size should I use for this recipe? I think my pan is 9″ or 10″, would I have to increase the ingredients? If so, how much. I would say a 10 or even better 10 1/2 inch pan. I made it last night with a 10.5 inch spring pan and a 10″ spring form pan worked great. Good luck. I made this in a traditional cheesecake pan and they came out perfect no cracks ,light and fluffy and absolutely delicious. Thank you for this recipe. Hi. Thank you for the nice feedback, I am glad you liked them. My cheesecake doesn’t look cooked enough, it looks runny, it’s been in the refrigerator for 2 hours, will it continue to set up in the refrigerator? its shouldn’t be runny, you probably under cooked it and also removed it from the oven too soon. A cheesecake is done baking when the center is just slightly wobbly, not runny. I would recommend bringing it to room temperature and after continue baking it. Higher chances that it will crack, since you put it in the fridge. Does it really use Four 8 oz. of cream cheese? yes, you can use less for a cheesecake that is not that tall. Can you please tell me if I can keep this at room temp after refrigerating them to firm up? Or do they have to be kept in the fridge? You can for a few hours, but they need to stay refrigerated. How long do you intend to keep them at room temperature? Hi Judith, I just tried printing it and it works fine for me. You can also take a screenshot or copy paste the recipe in word and print. I am sorry for the trouble. Its a great recipe. I hope you try it. Looks amazing!!! 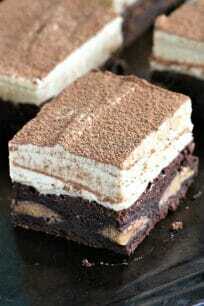 Can’t wait to make these for work! It says to pour 1/2 the cheesecake batter in then place in freeze….what do I do with the other half? Thanks ? 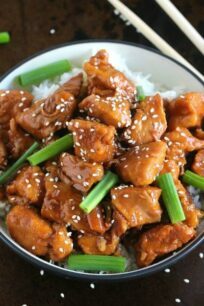 I just made this recipe. It turned out GREAT! No cracks just perfect. This recipe is VERY time consuming. I am taking it to a dinner today . I’m sure everyone will enjoy it. Thanks for sharing the recipe . I am very happy that you liked it!!! I haven’t tried making them yet but it’s looks simple and scrumptious. I like that there is a recipe for gluten free crust as well. I plan to make this tomorrow however I am a little confused on the cream. It calls for Heavy cream and heavy whipping cream. I found heavy whipping cream but not heavy cream. When i google the ingredient to find out what it looks like, i am told that heavy whipping cream is another name for heavy cream. So are the two ingredients the same? Or am i suppose to buy two different ingredients? I am so lost-also is there something i can substitute for heavy cream? Yes, it can be done. Do you want to skip the graham crust? If no, just start with it, press into the liners and chill. Add the white cheesecake layer, a few tablespoons, up to the mid of the cupcake liners. Chill until firm and top with the pumpkin layer. Bake. I would bake for about 30 minutes, but check on them closely. Can I make 2 8×8 or 9×9 instead of. 9×13 ?? 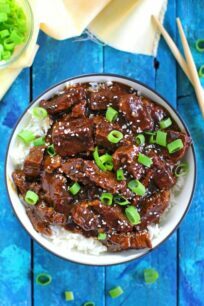 I made this recipe in a spring form pan a few weeks ago. my husband loved it so much that he’s insisting I make it again for his work’s thanksgiving. Thanks so much for the awesome recipe. Please pray for me that it turns out as good this time as it did the first time ?. I usually tend to bomb recipes when I make them for other ppl lol. 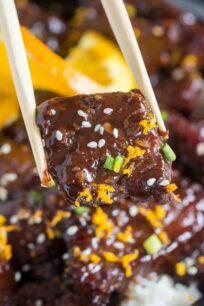 I’ve made these twice now for two potlucks and they’ve been a hit both times, people raved about them. I lined my pans with parchment paper which made removing them super easy and also no cracks. Time consuming but well worth it. Absolutely delicious!! They are perfect for any dinner. I made these but I’m bringing them to a party. Can I put the cream on top a few hours ahead of time? The recipe says to add the cream right before serving? Thank you. A few hours ahead should be fine, even 24 hours before works. Just make sure you keep the bars refrigerated. I made these as mini size cups with a gluten free crust and mixed all the layers as 1….they turned out as perfection!!! 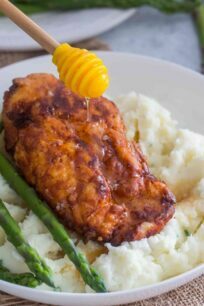 Is a water bath or spring form pan a must for this recipe? A cheesecake like this will be a 1st for me and I am unfamiliar with a water bath. Spring pan is a must, water bath you can skip, but you may get some cracks in the cheesecake.